Sweden Confirms Foreign Sub Snooped In Its Waters : The Two-Way The intrusion occurred last month. Although defense analysts have said Russia is the likely culprit, Swedish authorities say it's "impossible" to say whose submarine it was. 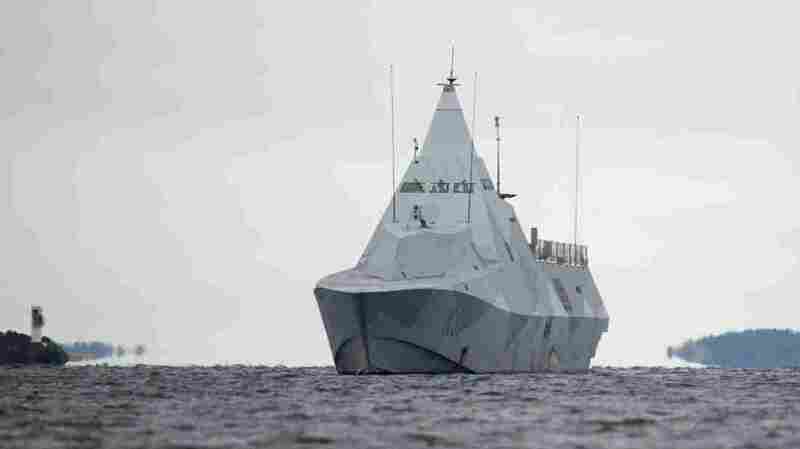 The Swedish corvette HMS Visby is engaged in a military operation on the fifth day of searching for a suspected foreign vessel in the Stockholm archipelago, Mysingen Bay, Sweden, on Oct. 21. Swedish authorities say they have proof it was a foreign sub but don't know the nationality. Sweden says it's now sure that a foreign submarine illegally entered its territorial waters last month, but it still can't say which country is responsible. 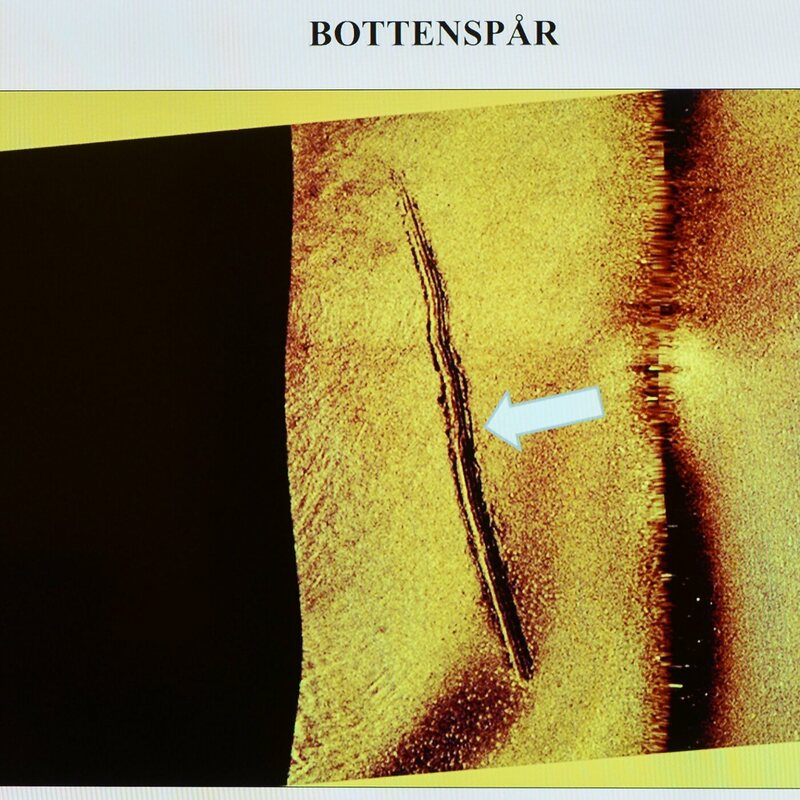 A sonar image showing subsea tracks left behind by a minisubmarine, according to the Swedish military. As we reported last month, the Swedish government launched its largest submarine hunt since the Cold War, dispatching helicopters and stealth ships to hunt for whatever it was in a grainy photograph taken by a member of the public along the Baltic coast east of the capital. "The military can confirm that a small U-boat breached Sweden's territorial waters," the head of Sweden's armed forces, Gen. Sverker Goransson, told a news conference. "We can exclude all alternative explanations." Prime Minister Stefan Lofven, who attended the news conference with Goranson and Defense Minister Peter Hultqvist, warned of "enormous risks" to the trespasser and said that "all available means" would be employed to defend Sweden's territory. Although Swedish authorities never said what nationality they believed the sub to be, military analysts suggested it is most likely Russian. Goranson acknowledged that it is "impossible" to confirm the nationality of the sub. "But we can confirm the fact that it has been there," he said. A photo shows an object traveling southward at a speed of 1 knot inside Swedish waters on Oct. 15. 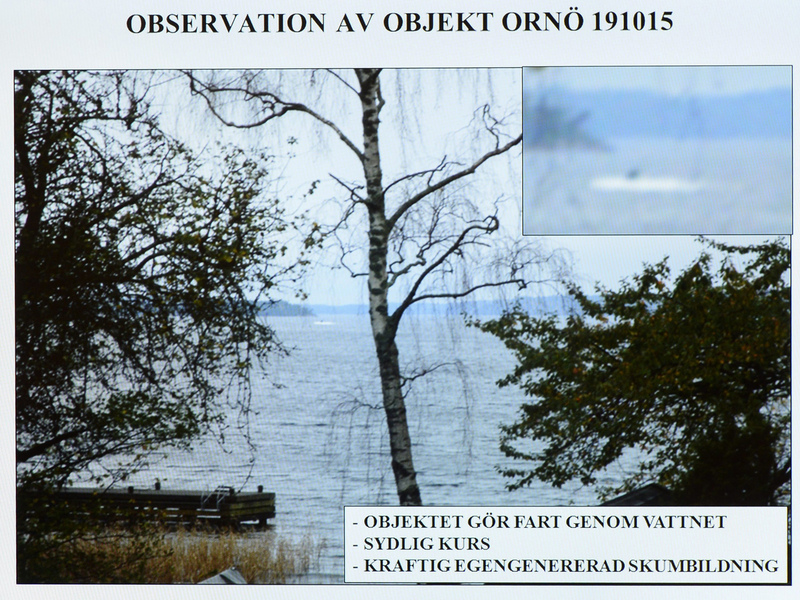 The white area around the object shows water escaping from valves at a pressure before the object disappeared below the surface, according to the Swedish military. "The submarine's presence was picked up by military sensors, Goransson said. Supporting evidence, he said, included a picture showing a bubble pattern typical of a diving submarine and a sonar image of tracks on the sea floor. "Sweden has already said it will increase spending on its military, including up to 70 new fighter jets and new submarines, as it looks to reverse decades of underspending on its armed forces. "The Nordic country has also drawn closer to NATO in the past few years although the current government has ruled out seeking membership of the U.S.-led alliance."